The 2013/2014 fandom_stocking treats have been revealed, and I'm looking forward to this weekend, when I'll be able to dig through all the stockings that requested my fandoms (and perhaps also read a few more Yuletide and hlh_shortcuts stories). A Forever Knight Nick & the Schankes story (plus Janette, Natalie and Lacroix references! ), set before the tag of first-season's "Hunters," but after the climax: "Intrusion" by pj1228 (~1,500 words, gen, G). Highly canon-aware! A Sleepy Hollow Ichabod & Abbie interlude story (with horses! ), tucked between the looming cliffs of their adventures: "Two-in-Hand" by st_aurafina (~700 words, gen, G). A classic interlude! 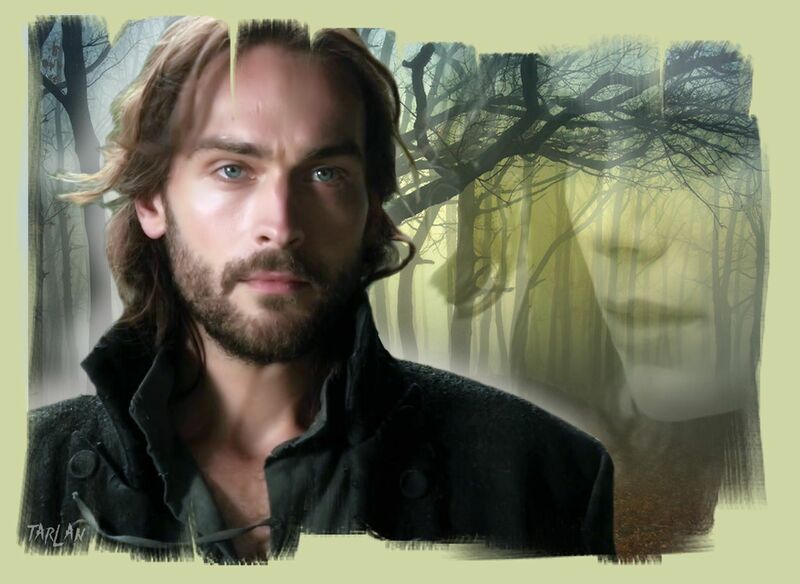 A Sleepy Hollow Ichabod/Katrina manip desktop wallpaper by tarlanx, with intriguing symbolism! Gorgeous! Fiction "gift certificates" of various lengths and in various fandoms from sharpest_asp, ravenela, argentum_ls and skieswideopen! Exciting! Yay, things to which to look forward! 01/11/14: Ravenela just fulfilled her "pledge" with the Highlander Duncan/Tessa vignette "Acceptance," coordinating with the "Counterfeit" flashbacks! Recommendations with links to three Person of Interest fanmixes from somehowunbroken! This is a fairly new form of fannish expression to me: interesting! Recommendations with links to four Highlander pic assortments, and also to one page of Highlander filk lyrics, from alexia! (Two of the pic assortments are by JinxedWood.) Amusing! Happy holiday greetings and art from wendymypooh, sjh2009, leesa_perrie and twinsarein! Jolly! Thank you, everyone! These have been so much fun! I wrote two short stories, myself, one Forever Knight (Lacroix & Natalie & Nick; thank you for the beta, skieswideopen!) and one Highlander (Methos/Alexa; thank you for the beta, celli!). I also handed out a few fanfic "gift certificate" promises where I'd much wanted to write (more FK! more HL! someone even requested original BSG, but it didn't get tagged properly so I missed it till the end! ), but couldn't fit it in. I plan to post about those on the weekend. I need to transfer the two stories from Dreamwidth comments to the AO3, and perhaps sneak in one more polish.